CLEARNACE PRICE! FREE Shipping EVERY item for the holidays! >>>> DON'T MISS all of our great GOLF GIFTS and Perfect STOCKING STUFFERS! The Frogger Golf Cart Poncho is the take anywhere/anytime golf cart enclosure ready to deploy on a moments notice when the weather turns wet, or blustery. It installs in minutes, weighs only 17 ounces, and when folded it is about the size of a football! Yet, it fits any standard 2 passenger golf cart to keep you warm and dry inside. It is made from durable, waterproof Polyester, and features soft PVC clear side and front windows. You can spend hundreds on custom cart enclosures, or worse yet endure mother nature's cold and rainy days. By why?? The Frogger Golf Cart Poncho is the low cost, convenient, portable and universal solution! Perfect Gift for any golfer! It is made from durable, waterproof Polyester, and features soft PVC clear side and front windows. You can spend hundreds on custom cart enclosures, or worse yet endure mother nature's cold and rainy days. By why?? 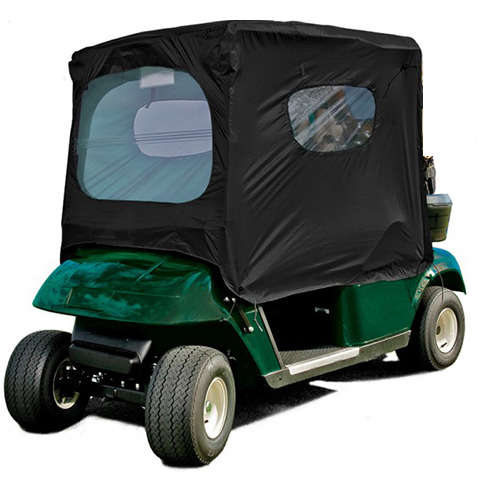 The Frogger Golf Cart Poncho is the low cost, convenient, portable and universal solution!